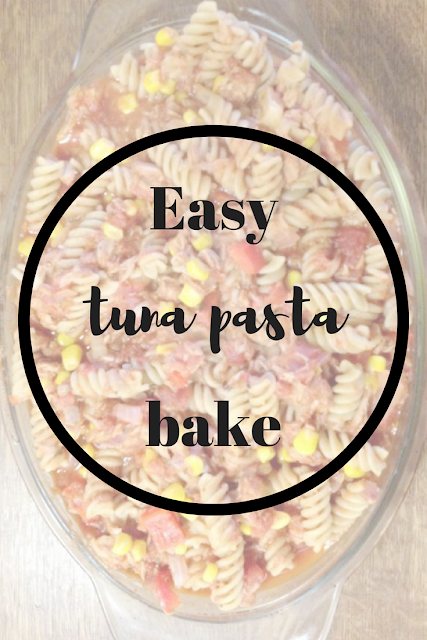 So, basically tuna pasta bake is one of my favourite comfort foods to make at uni. It's cheap, involves hardly any prep and is so gloriously carb-filled that it's perfect for days when I just want to slob out and chill. If you have a couple of tupperware boxes to hand, this is a brilliant recipe for creating leftovers. Personally I hate having to get up and prep my lunch before going to uni - this way, it's already ready from dinner the night (or a few!) before. 1.) Start boiling some water for the pasta. Preheat the oven to 200 degrees celsius, or 180 if it's a fan oven. Add a pinch of salt to the water to prevent the pasta sticking together. 2.) Finely chop the garlic, onion and red pepper. 3.) Put the oil into a saucepan and heat. Add the chopped vegetables. 4.) Stir the onion, pepper and garlic until the onion has gone soft and transparent. 5.) 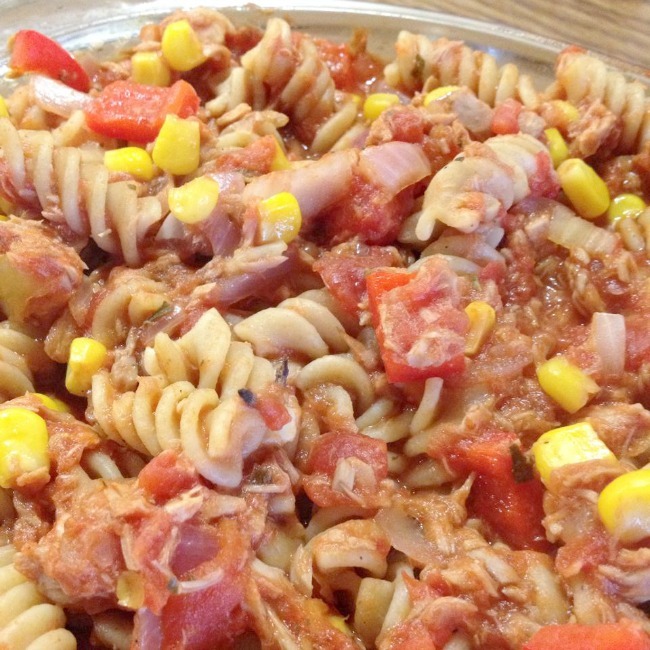 Add the two tins of chopped tomatoes, sweetcorn (drained) and tuna. Drain and mash the tuna up before you add it, otherwise you end up with huge lumps of tuna in the meal and it won't be spread evenly in each portion. 6.) Add the ground black pepper and mixed herbs. 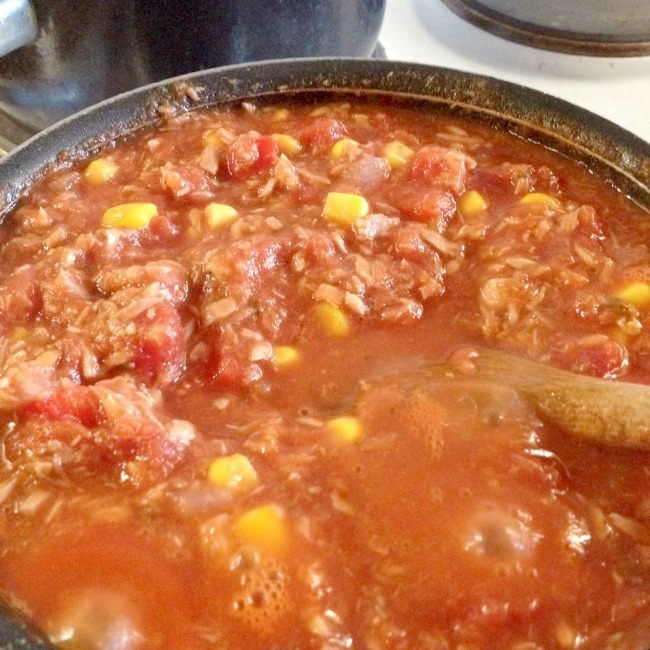 Leave to simmer for 10-15 minutes. 7.) Drain the pasta and pour into an ovenproof dish. Pour the sauce on top of the pasta. 8.) Mix thoroughly, taking care not to spill any. It should now be ready to put in the oven. 9.) At this point if you wish you can sprinkle cheese over the top. Place the dish in the oven for 8-10 minutes. Serve. What's your favourite meal to make in bulk?